Is it Koh Lanta or Ko Lanta? You will find different writings of the word „Ko“ or „Koh“. What is right? We believe that it should be written without the „h“ as „Ko“ means island in Thai and is pronaunced as a very short „o“. Therefore we have decided to use the word „Ko“ always without the „h“ as this seems to be the better translation (เกาะ = island). How did the island of Ko Lanta get its' name? What does the word "Lanta" actually mean? While the origin itself has still yet to be proved conclusively, there are a number of interesting proposals. The first is based upon the Javanese word used to describe a sieve, named “Lantus”, used for drying fish. This is a food-saving process still used during the monsoon season by the New Thai (Sea Gypsies) on Lanta today. Another reliable source claims that the original word "Pulau Lun-Tuck" or "Pulau Sa-Tuck" stems from the Malaysian language, meaning “the island with a long mountain range”. Examination of ancient documents by historians have prompted further claims, since the times of sea maps from Arabia showing the island was first known as “Janub Lanta”, meaning Southern Lanta. And other sources yet indicate that the word "Laan-Ta" was the original name of the island. This last comes from a Thai word meaning “to get blurry eyes”, due to the dust generated from shells on the many long beaches. The island's name was officially declared to be “Lanta” about one hundred years ago, during the reign of King Rama the Fifth. It was at this time also, that the first Chief Officer to govern the Ko Lanta district was elected. The first governor's office (today a museum), built in classic Thai-style, is a two-storey wooden house still standing in Old Town today. Ko Lanta's history stems from traders who came by boat from China, and the Arab continent, originally using the island as a stopover point. In fact, Ko Lanta's Old Town on the east coast of the island is still home to some of the first traditional wooden Chinese long houses built here. Before the First World War, Saladan at the most northern point of the island was the checkpoint for all tax-paying boats en route to the Malay peninsular. In 2012 construction began on a bridge to link the developed Ko Lanta Yai with the undeveloped Ko Lanta Noi. The bridge has finally been opened on April 22, 2016. This is expected to lead to the gradual development of tourist facilities, as well as government infrastructore on both Ko Lanta islands in the future. 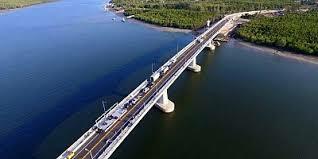 The second bridge between the Mainland and Ko Lanta Noi has already been approved by the central government in Bangkok and is due to be finished in 2023.